We're up to our third campaign add-on for September's wonderfully colorful and gun-filled Borderlands 2. Like the previous two DLCs that focused on one personality—Captain Scarlett followed by Mr. Torgue—Sir Hammerlock's Big Game Hunt leads you into various dangers thanks to one well-articulated individual: Sir Hammerlock. What was meant to be your weekend shootout expedition with Hammerlock gets sidetracked by Hyperion's Professor Nakayama. See, he was a huge Handsome Jack supporter, and not too keen on the vault hunter(s) who defeated him. 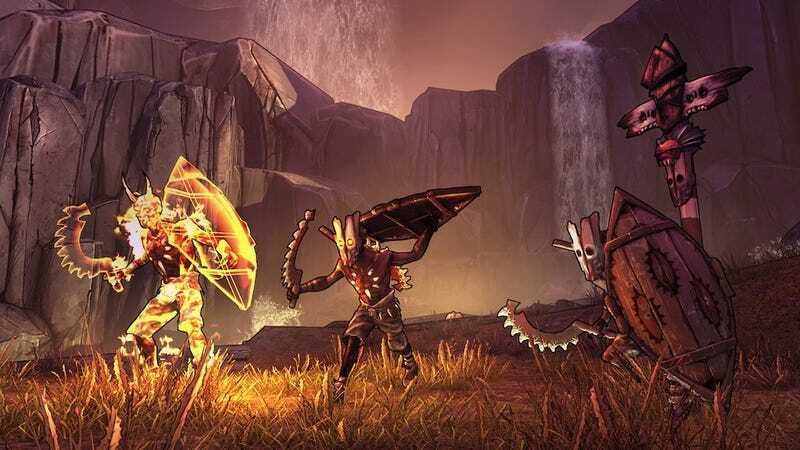 So before you can go hunt this new continent's biggest game, you'll have to stop the latest psycho Borderlands has introduced you to. I've played a good chunk of Sir Hammerlock's Big Game Hunt, so I thought I'd share a few details before the newest content releases to the public. Here are some noteworthy highlights. If you've already completed Borderlands 2's main game, the last two campaign DLCs might have felt like a breeze. They certainly did for me. But Gearbox took notice, and made Sir Hammerlock's Big Game Hunt a hell of a lot tougher. It'll be an actual challenge to fight through mobs of enemies. In fact, you'll have to be at least level 30 just to tackle the thing. The more appropriate difficulty scale is partly to do with new enemies, specifically one new enemy type. In Sir Hammerlock's Big Game Hunt, you'll be exploring a new continent—called Aegrus—full of mountains and swamps. But Aegrus doesn't just bring a new aesthetic appeal; it's riddled with new enemies, too. The swampy greens and mountainous browns are overrun by savages. Savages are basically like bandits. They look like headdressed, tattooed, spear-and-shield-equipped bandits. They even evolve like bandits do when you don't kill them fast enough. Midgets still jump up behind you while squealing in that adorably terrifying way. You know the one. But these tribes of savages don't behave exactly like bandits do. Because they've got a chief. Chiefs can heal their friends, themselves, and send out powerful attacks (fire or slag, for instance) to slash at your health bar. Giving one enemy type this much power means one important difference for you: you'll have to focus all of your gunfire on this target first, unless you want to unload your clip into a bandit-style savage only to see his health bar reset thanks to these pesky witchdoctor-types. They'll buff their friends while debuffing you, which results in nasty effects like slowing you down. Then there are big, flying things called Spores. They hover above you, dropping mini, kamikaze versions of themselves onto your head. Scaylions are Varkid-like, bug creatures. Together these new enemies make up what feels like a fresh Borderlands experience. I really wish I could tell you the new vehicle is the two-seater motorbike we saw in Mr. Torgue's Campaign of Carnage. And I really wish I didn't have to tell you that the actual new vehicle is a fanboat. The fanboat is all too similar to the sand skiff we saw in Captain Scarlett and Pirate's Booty. Sure, it maneuvers seamlessly between all possible directions within the 360 degree span quite a bit smoother than the sand skiff. And sure, its got a flamethrower and a corrosive acid launcher. But it still controls quite a bit like the sand skiff. Oh, and there are lots of customization skins for the fanboat that enemies will drop. 4. New Raid Boss. Plus, Bonus! : New...Rare Creatures? Voracidous is the name of the seraph guardian raid boss that will be the cause of your furrowed eyebrows when you get your hands on Big Game Hunt. He's a Stalker, but, fitting with the theme, you'll have to fend off against the Chief that controls him, too. Which, as you can imagine, means there will be other groups of enemies you'll have to deal with. Then there's Dexidous who will be the cause of one very long, sleepless night fighting through wave after wave of enemies. This "rare" creature will only be summoned after you supply various totems across Aegrus with a hefty ton of precious Eridium. Kill this Drifter and you can pick up Hammerlock-themed (aka hunting-themed) weapons. Hammerlock/hunting-themed weaponry aside, I found a ton of new weapons to replace my previous favorites. I get attached to my guns, even in a game like Borderlands that encourages you to constantly swap them out for new, shiny ones. But it's hard to argue with the insanely powerful pistols and assault rifles this new DLC throws at you. Did I mention these insanely powerful weapons are also insanely plentiful? By the end of Big Game Hunt, you'll have opened many, many loot chests. More than your feeble little backpack can handle. Sir Hammerlock's Big Game Hunt releases on January 15. It's covered in the Season Pass, or will be available individually for $9.99.